Inches Off Your Tummy reveals the secret to optimizing belly-fat burn. It promotes the use of 5-minute daily workouts that specifically target belly fat by burning up to 400 more calories every day. 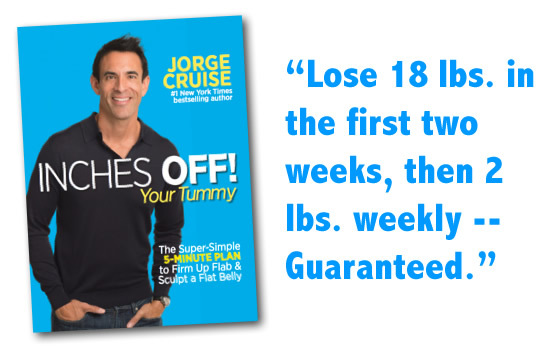 The book’s author, Jorge Cruise, is a New York Times bestselling fitness and weight loss author. His books include “The 3-Hour Diet” and “The Belly Fat Cure” series. The eating plan for this program is based on Cruise’s book, “The 100”. This is a low-carb diet that allows for a maximum of 100 calories from carbohydrates each day. You will need to limit your intake of foods including sugar, bread, potatoes, pasta, rice, fruit, and dairy. Cruise says that restricting carbohydrates turns off the messages that cause the body to store fat. When combined with exercise fat-burning is enhanced even more. He claims that by following his diet and exercise guidelines you will experience visible results in just six days. On this plan you are provided with a list of “freebies”, which are foods that contain zero calories from carbohydrates. You should still eat these foods in reasonable portions but you don’t have to strictly measure the amounts. Chicken breast, turkey bacon, egg whites, crab, flounder, salmon, ham, tofu, cheese, veggie burgers, almonds, avocado, oatmeal, black beans, asparagus, celery, cucumber, spinach, zucchini, snap peas, cauliflower, lettuce, mushrooms, berries, mayonnaise, salsa, coconut oil, olive oil, herbs and spices, dark chocolate, red wine. The foundation of this program is the 5-Minute Fitness Formula, which is based on the latest research in exercise physiology. It is designed to be more intense and more efficient than most 20 or 30 minute gym workouts. Inches Off Your Tummy provides a complete 4-week fitness plan that includes full-color photos. If you perform these exercises as outlined you will burn up to 400 more calories a day. If you feel like you want to do more exercise after 5 minutes you are encouraged to do so. However, 5-minutes a day is all most people need to achieve their fitness goals according to Cruise. Only necessary to workout for five minutes a day. Includes a comprehensive 4-week fitness program. Gym membership not required as the exercises can be performed at home. High protein, low-carb diet blunts appetite, which makes it easier to reduce calorie intake. Fast weight loss usually occurs with calorie-controlled low-carb diets. Dieters can enjoy dark chocolate and red wine in moderation. Most dieters who follow low-carb diets regain the weight within the first year. Some of the exercises may not be appropriate for dieters with joint pain or injuries. “Target” or “spot” fat reduction is not supported by research. Inches Off Your Tummy combines an intense 5-minute daily workout with a low carb diet. The author claims this approach can melt belly fat and burn up to 400 more calories a day. Most dieters will probably experience rapid results on this plan because low-carb diets reduce appetite and calorie intake. Fat-burning is also enhanced especially in combination with metabolism-boosting exercise. Fat will most likely come off in the same order it went on and not necessarily from the tummy right away. However, research also suggests that dieters who follow low-carb regimes tend to regain the weight within the first twelve months. To avoid this it is recommended to follow a healthy maintenance plan once the 4-week program is completed.